In order for democracy to flourish, citizens must be active participants in their government and their community. They must also be encouraged to think critically and must be free to express themselves. Community Television of Knoxville (CTV) promotes these democratic ideals by providing access to the necessary equipment and training to provide effective communication through the use of cable television. Since 1975, CTV has been providing media production facilities to the residents of Knoxville & Knox County for non-commercial use. 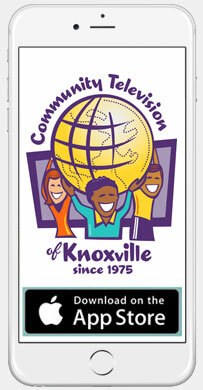 Accessible to more than 100,000 cable TV subscribers throughout Knoxville & Knox County (and millions more throughout the world via the Internet), the channel serves a wide constituency, including community residents, local government agencies, nonprofit organizations and other community groups. Providing Public, Educational and Government (PEG) programming not available anywhere else, program topics on CTV address a wide variety of issues related to local and global concerns, including the arts, living with disabilities, environmental issues, local government, historic preservation, physical & mental health, lifestyles, municipal & political affairs, religious & spiritual issues, sports, travel, recreation and more. Our new location is on the Plaza Level in the First Tennessee Building, and we are offering curbside service for equipment returns and delivery of finished programs. To request curbside service, please call 865-215-8848 when you arrive at the restricted loading zone in front of the First Tennessee Building on Gay Street. Convenient FREE parking is available one block away at the Dwight Kessel Garage. We will pay for your parking during the period of time you are at CTV. Just be sure to take a ticket when you enter the garage and bring it with you. You may use the elevator in the first Tennessee Plaza parking garage (one block up the street) to come up to the plaza level. Regular Office Hours are 9 am – 5 pm (Mon – Fri), but the actual hours of operation are subject to change on a daily basis based on production demands and the needs of our producers. Experience has shown that training workshops are best scheduled on an individual basis at times convenient to the producers, rather than creating set schedules that may or may not be convenient for everyone. Producers reserve studio equipment, portable cameras and editing suites using our computerized facility management reservation system. Our system has the capacity to cross check availability in real time and schedule reservations months ahead. Producers of regular series programs take advantage of this system by scheduling production facilities & equipment at the same regular time every month. This makes it much more convenient for them to recruit program guests and produce their shows. For your convenience, a drop slot is located at the front door so you can deliver your programs 24 hours a day.